Jeremy Jones, Jonaven Moore, and Mikey Nixon slog skyward on the Tantalus Glacier in British Columbia. 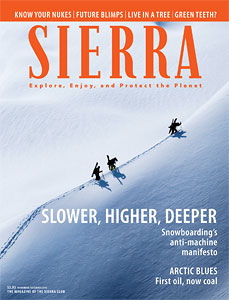 A snowboarding icon's anti-machine manifesto. Drifting through the Alaskan Arctic's massive, siren coal stash. The Arctic National Wildlife Refuge turns 50. Here's to 5,000 more. Can outdoor education really change a life? A Great Plains native finds his way home. Enter to win a deluxe trip and fantastic winter gear. º What is it with big open spaces? No climate bill? Get over it. Mr. Green: Is recycling a waste of energy? Minus 20 degrees, dark, and you're lost. Now what?